A number of seasonal holidays have close associations with sugary sweets but thankfully there are ways to reduce exposure to sugar without diminishing the fun factor. We present a list of options which are relatively low in sugar and should help to make diabetes control easier to achieve over a festive evening. 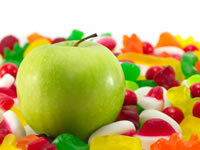 Sugar free sweets are available and are an option for people with diabetes. It’s worth checking which sweetener is used within the sweets as sugar alcohols (such as sorbitol, maltitol, erythritol and xylitol) can have laxative effects if taken in too high quantities. The other note is that sugar alcohols may raise blood glucose levels, albeit less severely than sugar. The effect on sugar levels can vary from one sugar alcohol to another. Sorbitol, erythritol and mannitol should have a relatively benign effect on blood glucose levels but it’s best to check blood glucose levels an hour or so after having the sweets to check their effect. Aside from sugar free sweets, you can also use some creativity to make treats that aren’t too intensely sweet. Cakes are popular whatever the occasion and needn’t be ruled by those of us needing to watch our carbohydrate intake. Sweeteners can be used instead of sugar and almond meal can also be used instead of flour to help lower the carbohydrate impact in foods such as cakes. Movie favourite popcorn is another snack that is closely associated with fun and good times. Unsweetened popcorn is about 50% carbohydrate by weight so a 30g serving, which makes for a decent portion, will have 15g of carbs. Butter popcorn makes for a more wholesome and less addictive experience than salted or sweetened varieties. Toffee apples are often very sweet but if you make these at home you can keep the fun and novelty aspect by giving the toffee apples just a light glaze of toffee, this could be done by part coating the apple in toffee rather than covering it all. Another trick is to coat the apple with melted chocolate and again the entire apple needn’t be coated. A smoothie can make a great substitute for sweets. A homemade smoothie is best as you can control the amount of carbohydrate and sugar. Using natural yoghurt is a good way to thicken the smoothie and berries can provide natural colour or artificial colours can be used for a wider variety of colour. Orange or red smoothies are great for Halloween or how about a green smoothie for a non-alcoholic St Patrick’s day drink? Nuts are a good choice for people with diabetes wanting a snack that isn’t high in sugar and carbohydrate. For a healthy nut option, buy unsalted nuts which are tasty and fulfilling without being so addictive, or as unhealthy, as salted nuts. Note that nuts do contain some carbohydrate so consider this in insulin dosing decisions and note calorie content if weight management is needed. Cut an x into the skin and roast in a shallow pan for about 30 to 40 minutes, turning occasionally to ensure the nuts are heated through. Whilst pumpkin itself can be something of an acquired taste, roasted pumpkin seeds make for a pleasant Halloween snack. A little olive, just a touch of salt and 15 minutes baking in the oven on a low heat is all that is needed to bring the flavour out. So, if you’re carving out a pumpkin, save those seeds for roasting! Cheese is free of carbohydrate and therefore can also make for a good alternative to sweets, as long as the calorie counts are kept to moderate levels. Cheese and apple chunks are a cocktail party favourite and Red Leicester cheese makes a great choice for Halloween. If you’re very arty you can even cut the cheese into pumpkin shapes.